Are you a fan of Pretzel Crisps®? My son and I discovered them about a year ago and we've been hooked ever since. My 10-year-old has been a pretzel fanatic from the very beginning. I can't tell you how many bags of pretzels I have purchased over the years. I, myself, have never cared for the density of pretzel, but I have always loved the salty outer coating of pretzels. 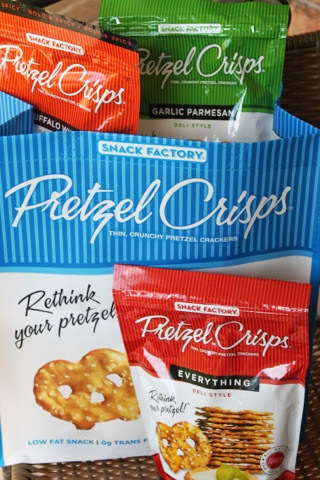 Enter Pretzel Crisps® which has created a product that takes the best part of the pretzel and turns it into a crispy snack. 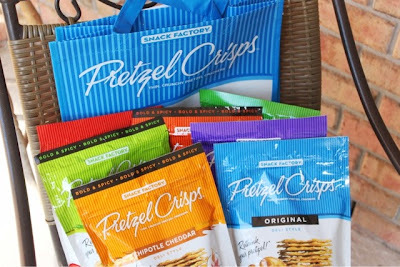 When I asked the makers of Pretzel Crisps® if I could work with their products, they were more than generous and sent me a large bag filled with a broad selection of deli flavors: Original, Garlic Parmesan, Buffalo Wing, Everything (think bagels), Sesame, Jalapeno Jack, and Chipotle Cheddar. According to the Pretzel Crisps® web site, there are also holiday flavors, Dark Chocolate and Peppermint and White Chocolate and Peppermint. Definitely, something to look forward to in the coming months. Besides being a healthy alternative to crackers, these crisps taste delicious and, with so many flavors to choose from, you're sure to find one that is just right for you. 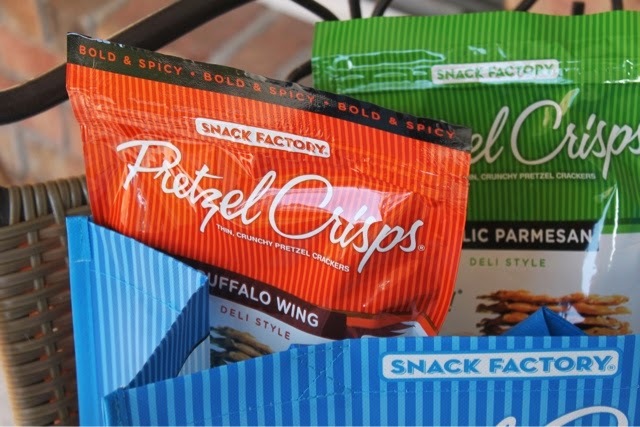 If you are a salty snack fan, you'll love these. The original crisps also make the perfect base for sweet indulgences, too. Use them to dip into a toffee or hazelnut spread or sit down with a bag and a jar of peanut butter. While these crisps are perfect alone without any dip at all, I felt inspired to create a dip using the Buffalo Wing Pretzel Crisps®. 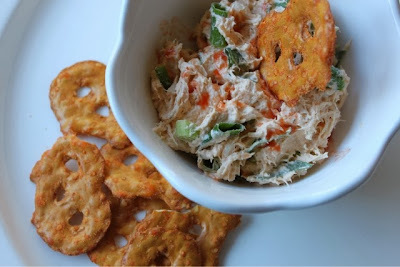 This dip like the Buffalo Wing Pretzel Crisps® has a mild kick of heat. Splash on more hot sauce if you feel the need. In a mixing bowl, combine the Ranch dressing mix, cream cheese, and hot sauce. Using a mixer, blend until fully combined. Stir in the chicken and green onions. Stir until evenly coated. Sprinkle on a little extra hot sauce for an extra kick. 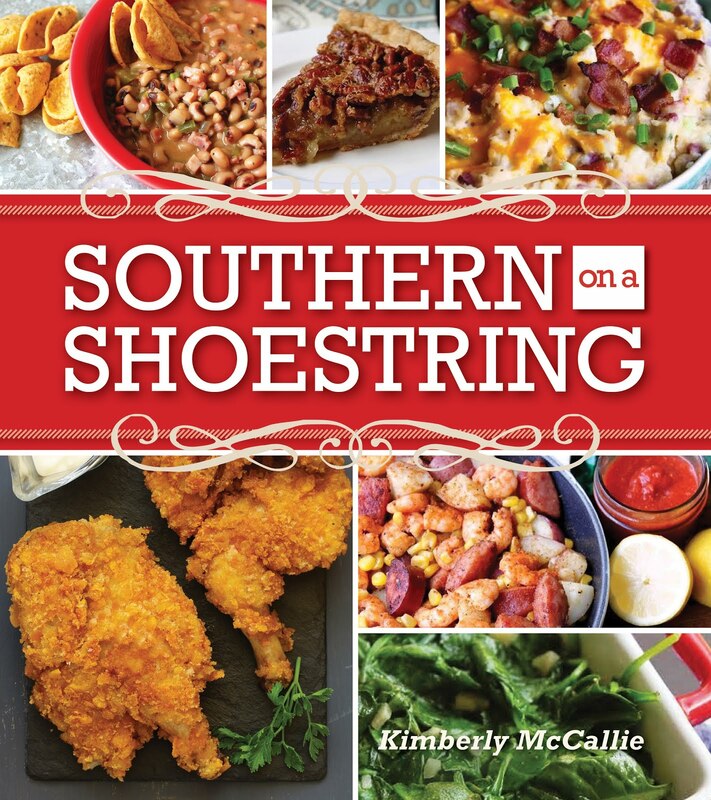 Serve with Buffalo Wing Pretzel Crisps®. Disclaimer: Pretzel Crisps® provided me with products to review; however, the opinion expressed here is my own.